The final resting place of many members of the Heller family, it is located about one mile north of the Heller Homestead site on Creek Road. A Brief History of the Lime Kiln Burial Ground If you've ever spotted the quaint Lime Kiln Burial Ground along Creek Road you may have wondered who is buried there. Read on to find out. By Karen Samuels (Open Post) - October 5, 2011 3:46 am ET Hellertown-Lower Saucon Patch. 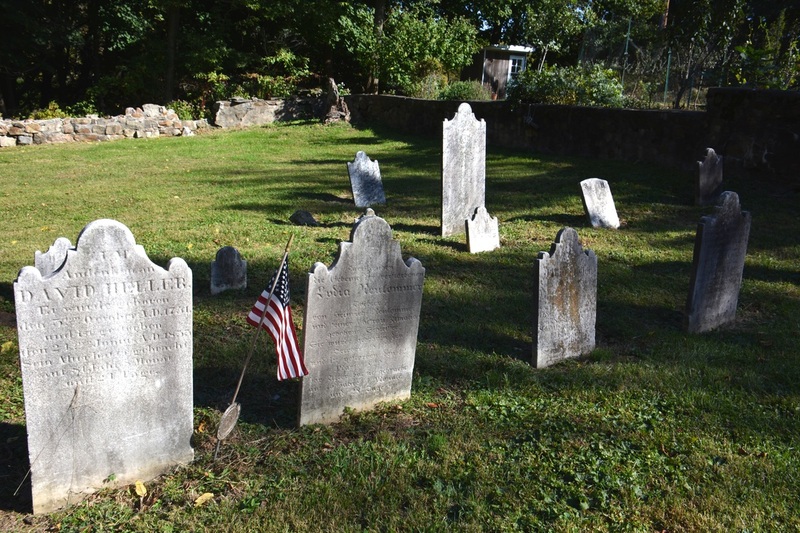 ​If you've ever spotted the quaint Lime Kiln Burial Ground on Creek Road in Bethlehem, you may have wondered who is buried there. "How old are those thin, crooked markers made of stone," you may have thought. "Are they connected somehow to the neat brick schoolhouse next door?" Looking at a list of headstones shared with me by Sue and Jim Brown, the owners of the historic schoolhouse, we find that the graves of many of the founders of Hellertown and Lower Saucon Township are located within the cemetery's 112 perches (a perch is equal to 16.5 feet of land). 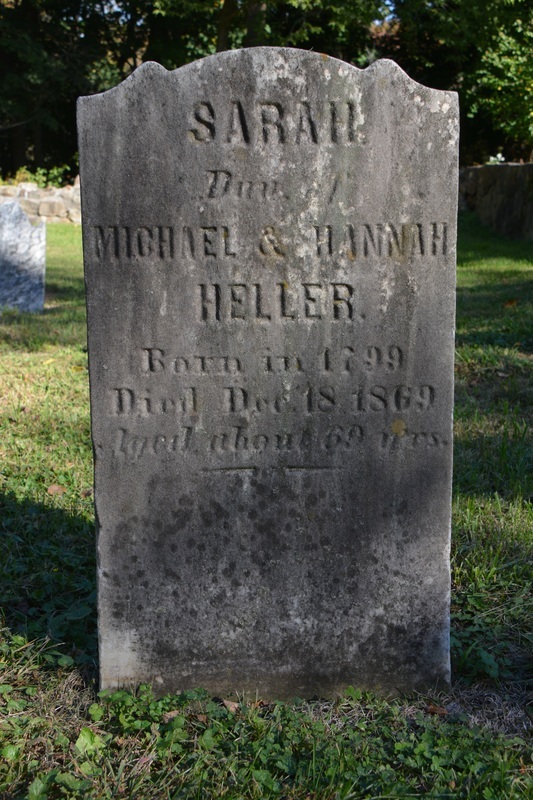 Among them are the graves of Christopher and Veronica Heller (1688-1778), and their children, Simon, Michael, Daniel, Ludwig, Christopher Jr. and Maria Magdalena, who are buried in the cemetery along with their families. The Heller family is credited with founding Hellertown. 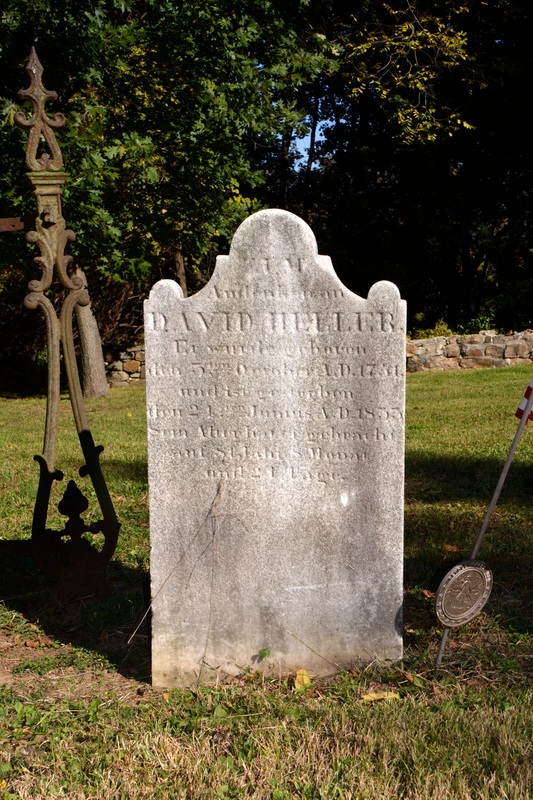 Dr. B.F. Fackenthal, Jr., who in 1922 documented the tombstones in the Lime Kiln Burial Ground, counted 18 headstones belonging to the Heller family, including the graves of Continental Revolutionary War soldiers Michael Heller Sr., and his sons Michael Jr. and David Heller. Prior to the Revolutionary War (1775–1783), Jacob Kram, a miller, directed that a tract of his land be donated jointly to the Mennonite Society and the German Baptist Society for use as a burial ground. Kram operated a mill along the Saucon Creek in what was then known as Lower Saucon Township. Mennonites are named for an early leader, Menno Simons, who was from the Netherlands. However, the religious group was begun in 1525 in Switzerland as the "Anabaptist" fellowship. In the ensuing decades the Anabaptists suffered great persecution throughout Europe because of their pacifist stance to war, and in 1683, the first Mennonite couple to emigrate to America helped settle the village of Germantown near Philadelphia. That settlement became what is today the oldest Mennonite community in the New World, and spawned additional settlements throughout the region, such as one in Coopersburg that may have influenced the Lime Kiln Mennonite group. 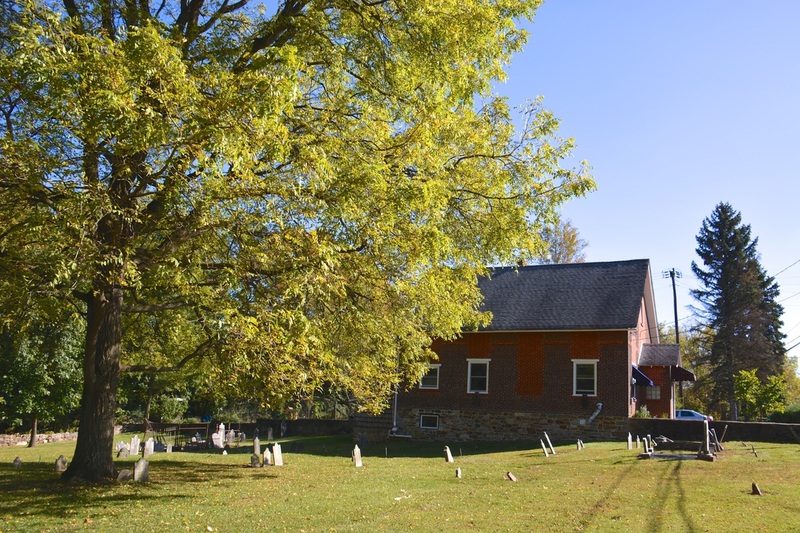 The exact date of the Lime Kiln Mennonite group's founding is uncertain, but a Mennonite meeting house was erected next to the cemetery in the early 1700s. The building was used for Reformed Lutheran services until the Lower Saucon Reformed Lutheran Church was erected in 1751 on Easton Road. In 1870, the property of the meetinghouse/school (not including the cemetery) was sold to the Lower Saucon School District. In 1919, the City of Bethlehem annexed the part of Lower Saucon Township in which it was located, and the school became part of the Bethlehem School District. 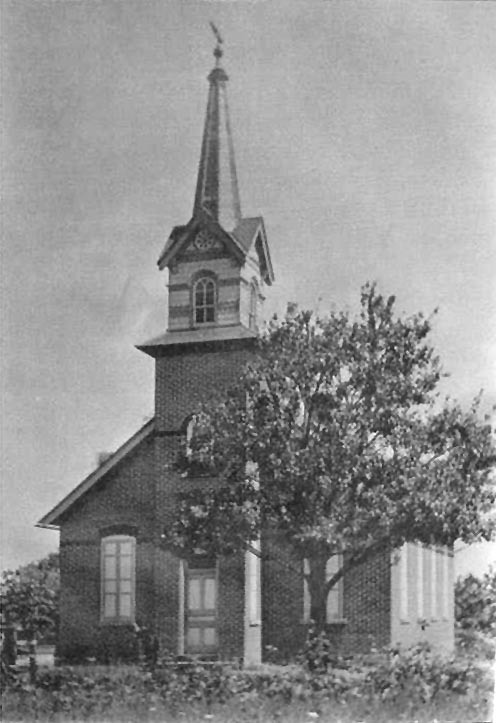 In the 1950s, the building served as a non-denominational Sunday school for a few years until it was sold in 1954 and converted into a private home, which it remains today. The oldest headstone in the Lime Kiln Burial Ground that is legible is identified as belonging to Catharine Rigelin and has the year 1771 written on it. Rigelin's native stone marker was carved in German script. The date of the most recent headstone that is legible is for Sylvester Hillegas, who was born Sept. 18, 1846 and died Feb. 9, 1894. In total, the Lime Kiln Cemetery contains 51 headstones bearing the names of Derr, Geissinger, Guth, Heller, Hillegas, Kauffman, Kram, Newkomer, Riegel, Roth, Rothrock, Weber, Weinke and Weinick. Of the unmarked headstones, some are of red shale. It is believed that a few local members of the Lenni Lenape tribe are also buried in this cemetery on the west bank of the Saucon Creek, not far from Lehigh University's Goodman Campus and Stabler Arena. The upkeep of the burial ground was in the care of the Boehm family, descendants of Rev. John Phillip Boehm, for generations. However, Hellertown Borough Council agreed to accept the donation of the cemetery from owner Calvin Boehm and caretaker Jim Brown in 2003, and today the borough maintains the historic burial ground. This post is contributed by a community member. The views expressed in this post are the author's. Registered users are welcome to post on Patch.